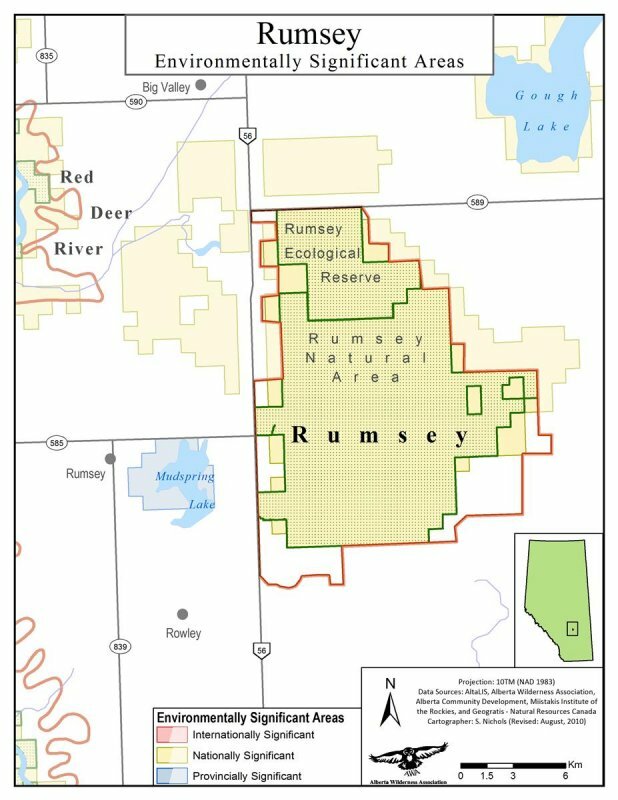 Located about 40 km north of Drumheller in the transition between Central Parkland and Northern Fescue Natural Subregions, Rumsey contains the largest remaining tract of northern fescue grassland in the world. AWA believes it is imperative that Rumsey is truly protected, which would involve: the expedited removal of oil and gas development, no new landscape disturbances, the restoration of old disturbances, the removal of invasive species, and public involvement in the management of the area beginning with the publication of a management plan. Rumsey is recognized for its vital importance as the largest remaining block of rough fescue grassland in North America. Special thanks to Dorothy Dickson for a historical overview of Rumsey and thanks to Cheryl Bradley for supplying important ecological and historical information. Lying in the transition between the southern grasslands and the northern boreal forest, Rumsey (also known as the Rumsey Block, Rumsey Parkland or Rumsey Wildland) is a mosaic of trembling aspen woodland, fescue grassland and wetland habitats. This pronounced ‘knob and kettle’ topography is important for many typical parkland plants and animals and is noted for its exceptional biological diversity. Located in south-central Alberta (about 40km north of Drumheller) and 241km2 in size, Rumsey is the only large, relatively undisturbed area of aspen parkland left in Canada (World Wildlife Fund of Canada, 1988). Rumsey is also recognized for its vital importance as the largest remaining block of rough fescue grassland in North America. Containing the Central Parkland and Northern Fescue Natural Subregions, Rumsey is representative of landscapes that are almost extinct and provides a valuable ecological benchmark. Less than 5% of Central Parkland in Alberta remains in natural condition (Alberta Parks 2015). Currently, only 1.3% of the Northern Fescue Grassland 0.9% of the Central Parkland Natural Subregions are protected. AWA’s Rumsey Area of Concern is composed of the 33.5km2 Rumsey Ecological Reserve in the northern portion of the block and the 149km2 Rumsey Natural Area in the southern portion. The Rumsey Ecological Reserve (33.5 km2) was established in 1990 in the northern part of the Rumsey Block Rumsey Ecological Reserve by Order-in Council 511/90. The Rumsey Natural Area (149 km2) was established in August 21 1996 in the southern part of the Rumsey Block by Order-in-Council 390/96 under the provincial Special Places program. This was intended as a ‘holding’ designation, pending its designation as a Heritage Rangeland, a category that came with Bill 34 amendments to the Wilderness Areas, Ecological Reserves and Natural Areas Act. Designation as a Heritage Rangeland has not yet occurred. Cultural Facilities and Historic Resources Division has identified the entire Rumsey Natural Area as a significant historic resource pursuant to the Historic Resources Act. On a basic level, the Rumsey Ecological Reserve and Rumsey Natural Area are both established and managed under the Wilderness Areas, Ecological Reserves Natural Areas and Heritage Rangelands Act, however, there are specific differences in how each of these areas is managed. The Rumsey Ecological Reserve is managed under the 1998 Rumsey Ecological Reserve Management Plan and its implementation was overseen by a Management Committee for the Ecological Reserve, which met until 2003. The Ecological Reserve contains a grazing lease. The history of managing the Rumsey Natural Area has been fraught with controversy, particularly with respect to new surface development of oil and gas leases. Although the provincial government has committed to the completion of a management plan for the Rumsey Natural Area since 2009, it is still being managed under the Rumsey Parkland South Regionally Integrated Decision. The Rumsey Parkland South Regionally Integrated Decision 1993 (RID) was a planning exercise initiated in 1990 to determine guidelines for managing oil and gas activity, cattle grazing and recreational use. This allowed oil and gas development in perpetuity in direct contrast to recommendations by the RID committee of government, industry, and conservation interests which called for the phasing out of oil and gas. After the designation of Rumsey South as a Natural Area in 1996, the RID became the de facto management plan despite the new protected areas status. A year after protection as a Natural Area, Alberta Energy began to sell new oil and gas leases in Rumsey. In 2004 Coal Bed Methane development began in Rumsey with the drilling of one well by Trident Exploration Corp. Developed in 1993, prior to the designation of the Natural Area, the RID did not even consider the advent of CBM. An Analysis of RID Commitments in 2007 outlines significant shortcomings with the government’s commitment to even the basic protective measures of the RID within Rumsey. In 2003, the provincial government released Alberta Energy Information Letter IL2003-25 which outlined the Alberta Government’s policy to honour existing mineral commitments in legislated protected areas; however, it specified that new commitments in the 81 Special Places (including the Rumsey Natural Area) would not be permitted new surface access. Initially, the Departments of Parks and Community Development asserted that the Information Letter confirmed rights sold after 1996 are not considered “existing commitments” and therefore do not require surface access. In 2006, Alberta Energy reneged on that promise and instead insisted that an “existing commitment” is any right that has been sold and remains undeveloped even if many years have passed and the right has been resold. This distinction permitted surface access for mineral rights sold in Rumsey after its designation as a Natural Area in 1996 and was an open door to coal bed methane development in the area. AWA considers this to be an abuse of intent. On February 29, 2012 Alberta Energy changed the requirements for future energy leases sold for Rumsey Natural Area so that the addenda on all new petroleum and natural gas agreements within the Rumsey Natural Area will read “Surface Access is Not Permitted.” Previously, leases were sold with “Surface Access Subject to Restrictions” though in March 2009, for approximately half of Rumsey, this was changed to “Yet to be Determined.” AWA regards this as an encouraging first step in the long-term phase out of oil and gas activity in the Natural Area. AWA believes the Rumsey must be properly protected and managed as a single unit. This would involve the expedited removal of oil and gas development from Rumsey and public involvement in the management of the area, beginning with the publication of a management plan. There must be no new fragmentation of the rough fescue grasslands, old disturbances must be restored to native condition, and invasive species removed. AWA’s Rumsey Area of Concern is 241 km2 in size and is located in south-central Alberta, about 40km north of Drumheller. It is composed of the 33.5km2 Rumsey Ecological Reserve in the northern portion of the block and the 149km2 Rumsey Natural Area in the southern portion. Rumsey is composed of an extensive rolling parkland landscape made up of glacial till forming a pronounced knob and kettle topography. Lush, fescue grasslands occupy moist hilltops and slopes, aspen woods are prevalent on north-facing aspects, small shrubbery areas of buckthorn and rose occur, and sloughs are found in depressions. The fescue grasslands on top support populations of uncommon fescue grassland birds. There are also a number of deeper and more permanent wetlands. The area has a continental, microthermal, fairly dry climate with cold winters and long, cool summers. 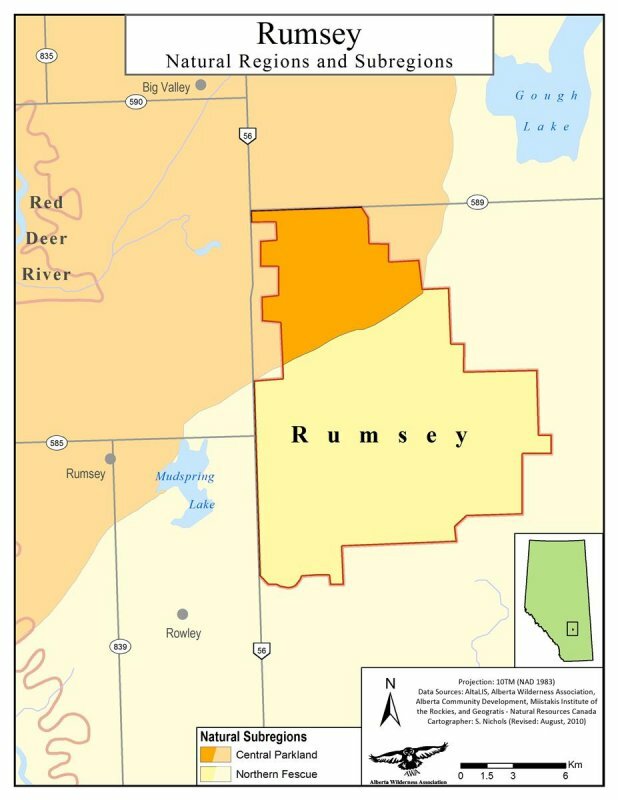 Rumsey is located within the Red Deer River Watershed, which is a sub-basin of the South Saskatchewan River (Red Deer River Watershed Alliance 2009). Water within Rumsey largely drains into the numerous “kettles” within the area. These poorly drained depressions result in numerous wet meadows and ponds, many only seasonally wet. Most ponds are 854 – 861 m above sea level; the hill tops (“knobs”) range from 861 – 877 m.
A former glacial spillway, known as the Snake Lake Valley, runs through the northwest portion of the area. This forms part of the Snake Lake drainage which eventually flows via Big Valley Creek into the Red Deer River about 14 km west of Highway 56. The spillway is broadly U-shaped, over 0.8 km wide and 12 m deep. It has two shallow saline sloughs and two marshes along an ephemeral stream. The rolling parkland landscape of Rumsey is made up of glacial till forming a hummocky disintegration moraine known as the Beaverhills Moraine. A pronounced knob and kettle topography is typical. It is composed of rounded depressions (kettles) alternating with knolls (knobs) which are uniform in size and height. Average relief is about 10 m. Elevations range from approximately 846 to 884 m above sea level. A former glacial spillway, known as the Snake Lake Valley, runs through the northwest portion of the area. In the northern part of the Ecological Reserve a number of flat-topped moraine plateau rise above the hummocky moraine. They were formed in part by the deposition of water-transported material into small superglacial lakes. Both the Rumsey Ecological Reserve and the Natural Area are designated nationally significant. Rumsey is the only large, relatively undisturbed area of aspen parkland left in Canada (World Wildlife Fund of Canada, 1988). Rumsey is also recognized for its vital importance as the largest remaining block of rough fescue grassland in North America. The Ecological Reserve lies on the southern “groveland” edge of the Central Parkland subregion of the Parkland natural region. 4.3 km2 of the 34.32 km2 area lies within the Northern Fescue subregion. 144.3 km2 of the 149.22 km2 of the Natural Area, or Rumsey South lies in the Northern Fescue subregion of the Grassland natural region, 5 km2 is in the Central Parkland subregion. The vegetation of Rumsey consists of a patchwork of aspen and balsam poplar woodland, fescue grassland, tall and low shrub thickets, and a great variety of marsh and wet meadow habitats. The balance of grassland and woodland has been determined by climatic fluctuations, fire, grazing and browsing. 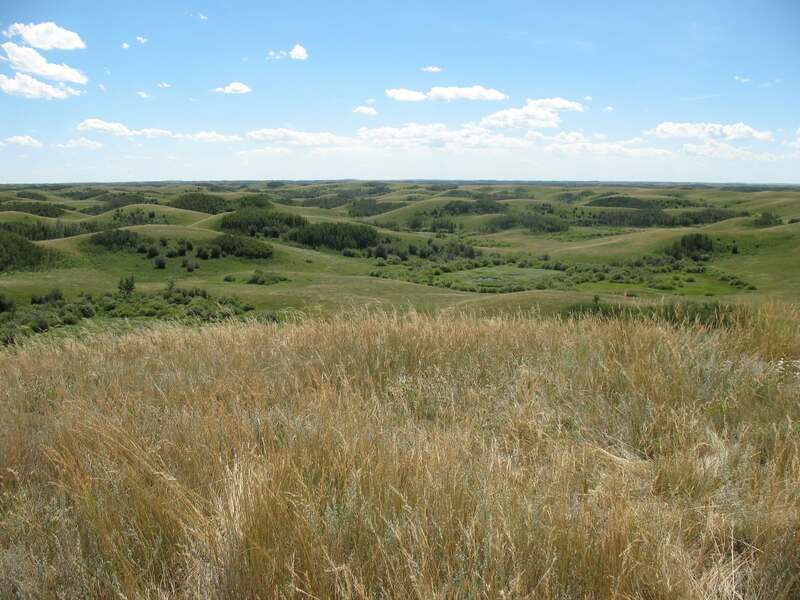 The Rumsey area includes one of the largest remaining areas of plains rough fescue grasslands in Canada. An estimated 12 percent of original native grasslands in the Northern Fescue and Central Parkland Natural Subregions in Alberta remain (Bjorge et al. 2004, Desserud 2016 ). Of that 12 percent remaining, approximately 42% have invasive species (Holcroft Weerstra A.C. 2003). Rough fescue: Moist sites with little/no grazing contain plains rough fescue (Festuca hallii), increased grazing pressure bring an increase in western-porcupine grass (Stipa curtiseta), three flowered avens, wood lily, crowfoot violet. Of 112 typical plant species of aspen and poplar woodlands found in the Central Parkland region, 68 occur within the Ecological Reserve. Only 12 of the major species have not been found at Rumsey, being more typical of aspen woodlands further north. Of 87 species belonging to the northern fescue grassland, 82 occur at Rumsey. Plants at the southern edge of their range are: arrow-leaved coltsfoot, marsh ragwort, spangletop grass, silvertop sedge, basket willow, Bebb’s sedge. Plants at the northern edge of their range are: thread-leaved sedge, yellow umbrella-plant, death camas, lance-leaved goldenweed. 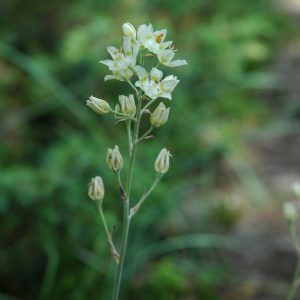 Uncommon plants of the Central parkland that are found at Rumsey include: American wintercress, mountain willow, reflexed locoweed, single spike sedge, Sartwell’s sedge, wedge-grass, slender beaked sedge, alkali bluegrass. Grasslands: upland sandpiper, Sprague’s pipit, Baird’s sparrow, horned lark, vesper sparrow, western meadowlark, Savannah sparrow; Richardson’s ground squirrel, thirteen-lined ground squirrel. Low Shrubbery: clay-coloured sparrow, Brewer’s blackbird, thirteen-lined ground squirrel, rare prairie vole. Aspen woodland: More than 20 species of breeding birds, including red-eyed vireo, house wren, northern oriole, least flycatcher, ruffed grouse, sharp-shinned hawk, blue jay, robin, clay-coloured sparrow, American goldfinch, black-billed magpie, common crow, warbling vireo, ruffed grouse, tree swallow, mourning dove; white-tailed deer, mule deer, deer mouse, short-tailed weasel. Tall Willow Shrubbery : At least 6 species of birds including alder flycatcher, yellow warbler, cedar waxwings, eastern kingbirds; snowshoe hare, American porcupine. Wetlands: At least 10 species of waterfowl, including mallard, gadwall, blue-winged teal, lesser scaup, redhead duck, canvasback duck, mallards, pintails, widgeon, horned grebe; wood frog, chorus frog, leopard frog; sora, common snipe, red-winged blackbird, common yellowthroat, LeConte’s sparrows, savannah sparrows, sharp-tailed sparrows; meadow voles, northern pocket gophers; shorebirds – killdeer, American avocet, marbled godwit, willet; American beaver, muskrat, horned grebe. There is one grazing lease on the Ecological Reserve and five on the Natural Area, of which 3 are individual and 2 are grazing associations. According to the RID, livestock graze from June 1 – Oct. 31, the carrying capacity is set at 28 acres/head/year, totally 17,750 animal unit months (AUMs) (ID Assessment 2001). Rumsey is located within the traditional territory of the Blackfoot confederacy. Indigenous Peoples made frequent use of Rumsey, particularly in the winter when bison were foraging on rough fescue. A high density of archeological sites have been found within Rumsey, including tipi rings, cairns, medicine wheels, effigies, ribstones, caches, buffalo jumps, buffalo pounds, and projectile points. 1) The building of a permanent road (the Poco Road) straight through Rumsey in 1987, after over a decade of promises to protect Rumsey and guidelines prohibiting such a road were agreed upon by government, industry, and conservation groups. 2) The formulation of the final Rumsey Parkland South Regionally Integrated Decision 1993 (RID), which allowed oil and gas development in perpetuity in direct contrast to recommendations by the RID committee of government, industry, and conservation interests which called for the phasing out of oil and gas. Alberta Energy overrode that committee. 3) The designation of Rumsey in 1996 as a Natural Area instead of a Heritage Rangeland, which was promised by government. Heritage Rangelands have much more stringent guidelines for surface disturbance. 4) The selling of oil and gas leases the year after its designation as a Natural Area, with the Environment Minister boasting that Rumsey would be the leading example of how industrial development could be accommodated in protected areas. The promise of no new access or well sites was broken with the advent of coal bed methane (CBM). New access routes up to 200 m long were developed to new well sites. 5) The advent of coal bed methane (CBM) without any public consultation. The RID never considered CBM, which is known to have a much greater footprint than conventional gas. 7) The seventh was the ongoing abuse of the public trust Alberta Energy in the mid 2000’s. In 2003, the provincial government released Alberta Energy Information Letter IL2003-25 which outlined the Alberta Government’s policy to honour existing mineral commitments in legislated protected areas; however, it specified that new commitments in the 81 Special Places (including the Rumsey Natural Area) would not be permitted new surface access. Initially, the Departments of Parks and Community Development asserted that the Information Letter confirmed rights sold after 1996 are not considered “existing commitments” and therefore do not require surface access. Alberta Energy reneged on that promise and instead insisted that an “existing commitment” is any right that has been sold and remains undeveloped even if many years have passed and the right has been resold. This distinction permitted surface access for mineral rights sold in Rumsey after its designation as a Natural Area in 1996 and was an open door to CBM development in the area, an activity never contemplated in the RID or the 2001 Assessment. AWA considers this to be an abuse of intent. Clearly, there were many times when the government could have made the decision to truly protect this area. Instead, continued development was made the priority. In 2012, Alberta Energy changed the requirements for future energy leases sold for Rumsey Natural Area to read “Surface Access is Not Permitted.” AWA regards this as an encouraging first step in the long-term phase out of oil and gas activity and eventual true protection of the Rumsey ecosystem. Although the provincial government has committed to the completion of a management plan for the Rumsey Natural Area since 2009, it is still being managed under the Rumsey Parkland South Regionally Integrated Decision (RID). The RID was developed prior to the designation of the area as a Natural Area and is considered out of date for the Natural Area, permitting oil and gas development to continue within this protected area for decades. The publication of a management plan for the entire Rumsey Block is urgently needed. Surface disturbances such as drilling, renewable energy development and road building pose serious threats to the ecological integrity of Rumsey. Over Rumsey’s history it has suffered an incursion of oil and gas wells, coal bed methane development, and road building due to a lack of true protection and an overarching management plan (see above, as well as Management section within Introduction for more). From 1951-2001, a total of 69 wells have been drilled within the Rumsey Natural Area; 10 of these have happened since the approval of the RID in 1993. 42 of these have been abandoned (Government of Alberta RID Assessment 2001). As of 2010 there are over 100 well sites in Rumsey. In 2004 Coal Bed Methane (CBM) development began in Rumsey with the drilling of one well by Trident Exploration Corp. Developed in 1993, prior to the designation of the Natural Area, the RID did not even consider the advent of CBM. Other companies that have leases in Rumsey include: EnCana, Canadian Superior, CNRL, Husky Oil, Pioneer Natural Resources. Concerns over CBM include increased density of wells (potentially 4-18 wells per section), a high level of fragmentation by pipelines, possible disruption of groundwater and other problems of access and cumulative effects, particularly on fescue grasslands, which have never been successfully reclaimed. There is approximately a 74 km of roads and trails within Rumsey with total linear disturbance of almost 100km (Alberta Government 1993). Rough fescue plant communities are at more risk of conversion to non-native community types than other grassland types in Alberta. Rough fescue grassland, once disturbed and/or invaded by non-native species, are less likely to be restored to native condition than other grassland types. Avoiding surface disturbance of rough fescue grasslands and preventing invasion by non-native species is a necessary planning and management strategy if we are to have rough fescue grasslands in Alberta in the future. 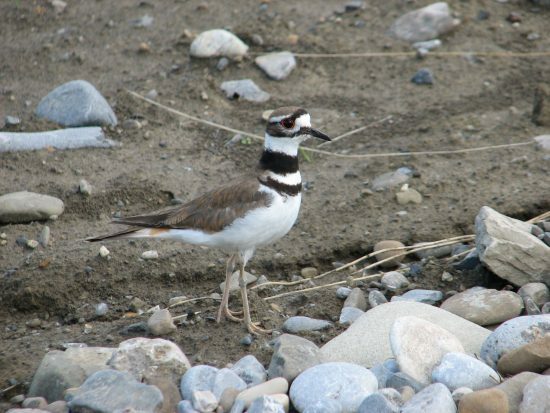 AWA has maintained that no new surface disturbances should be permitted within native Central Parkland and Grassland Habitat and that there must be an expedited phase-out of oil and gas development within Rumsey. Phase-out is the least cost (economic, environmental and social) option and the most honest and responsible approach. It meets past commitments and yet recognizes a clear societal intent to protect this significant natural area. Livestock grazing has occurred in the Rumsey Parkland since the early 1900s. Today, there is one grazing lease on the Ecological Reserve and five on the Natural Area, of which 3 are individual and 2 are grazing associations. According to the RID, livestock graze from June 1 – Oct. 31, the carrying capacity is set at 28 acres/head/year, totally 17,750 animal unit months (AUMs) (ID Assessment 2001). A review of mineral leases in the Rumsey Natural Area shows 79 Mineral Surface Leases and Right of Entry (total area: 57 sections). Some of these are active wells, some are inactive awaiting a decision, some are abandoned and awaiting reclamation, some are reclaimed awaiting certification and some were never drilled. AWA regards this as an encouraging first step in the long-term phase out of oil and gas activity in the Natural Area. The Assistant Deputy Minister for Parks and Protected Areas confirms that work on the management plan is moving forward. A promise to AWA by the Deputy Minister that a management plan would be developed remains unkept and AWA continues to ask for progress on the plan. It is AWA’s understanding that Energy, Sustainable Resource Development and Parks and Protected Areas have made some progress in understanding the issues in the Rumsey area and made agreements to work together on this plan. Further assurances have been given that there will be work on the plan in September. The provincial government commits to the development of a management plan for the Rumsey Natural Area. AWA and Alberta Native Plant Council (ANPC) meet with Paramount Resources and Sustainable Resource Development representatives to discuss Paramount’s proposed pipeline construction from a suspended well in 10-24-13-19-W4 to a well in 3-30-33-18 W4, both within the Rumsey Natural Area. AWA and ANPC maintain that oil and gas development should not occur at all in this protected area and that restoration of previously disturbed sites, especially with respect to invasive species, is urgently needed. Vegetation has been sprayed on a Husky pipeline, on which crested wheat grass is sprouting. Crested wheat grass has spread up a nearby hillside and will continue to spread (along with smooth brome) unless prevention measures are taken. Survey stakes mark a pipeline route and well centre near two abandoned wells in 1-3-34-19-W4. On one of the wellsites crested wheat grass persists and appears to be spreading. Willow thickets in SE24-33-19-W4 have been cleared with a bulldozer. A riparian woodland and shrubland in NW36-33-19-W4 have been cleared with a bulldozer. Extensive erosion where the main east-west access road (the Poco Road) descends a steep east-facing slope. Evidence of heavy grazing and trampling by livestock, some occurring this spring, resulting in a steep south-facing hillside north of the road being almost bare of vegetation. Livestock grazing in mid-May in north Rumsey NA. Studies have shown rough fescue grasslands are best grazed in the fall or winter and should not be grazed in early spring. AWA initiates a FOIP request asking for all documents, correspondence, and emails regarding proposed oil and gas development in the Rumsey Natural Area during 2007. A coalbed methane (CBM) well licence granted to Pioneer Natural Resources in 2007 in Rumsey Natural Area expires, a year after it was granted. The licence is cancelled two days later by the granting agency, the Energy Utilities Board. AWA meets with the Assistant Deputy Minister (ADM) of Tourism, Parks, Recreation, and Culture (TPRC) who makes a commitment to AWA to help set up a meeting with AWA, Alberta Energy, and TPRC to discuss oil and gas development in the Rumsey Block. AWA and the Alberta Native Plant Council (ANPC) participate in a field tour of Rumsey with the Technical Advisory Committee, visiting six research sites: Canetic Pipeline, Trident CBM well site, Canada Natural Resources Ltd. (CNRL) spill site, NOVA ethane pipeline, CNRL well site, and Enerplus well site. The Energy Utilities Board informs AWA and ANPC in a letter that their request for review of the approval of Pioneer’s CBM well has been denied. The Energy Utilities Board (EUB) gives Pioneer Natural Resources approval to drill a coalbed methane (CBM) well in Rumsey Natural Area in 11-2-34-19. AWA writes to the Alberta Parks Minister re Pioneer’s well, stating its disappointment that a CBM well was approved without public consultation or notification of key stakeholders including AWA, Alberta Native Plant Council (ANPC), and Red Deer River Naturalists. Pioneer says they did not consult with conservation interests because they are not on the LSAS and Registry Record, nor do they have standing with the EUB. Pioneer commits to consultation with AWA and ANPC in any future proposed activities. AWA asks that Parks request that Alberta Energy not grant a section 8 continuation to Pioneer for the well, which they were unable to complete by the time their lease expired March 6. The letter points out failings of the application and well location and application of the requirements of the RID. The Technical Advisory Group meets 5 times between Nov 2005 and Mar 2007, including a field trip to view industrial sites in the Rumsey Natural Area. TAG has developed a terms of reference and begun to guide implementation of research projects by PhD and MSc. students from the University of Alberta as well as by the Alberta Research Council. Consultants are undertaking range health assessment. Research is focusing on vegetation and soils on industrial disturbances in Rumsey, factors affecting restoration to native rough fescue communities and cumulative environmental effects of land uses in Rumsey. AWA’s FOIP request is delivered. Of the more than 2000 documents said to be in the file, only 124 pages are delivered. Letters from AWA and ANPC to new Ministers of Energy, Sustainable Resource Development, and Tourism, Parks, Recreation and Culture ask them to prevent further industrial disturbances and to honour IL 2003-25 by ceasing to make new mineral commitments or placing ‘no surface access addendum’ on rights when sold. ANPC is working with government and academics to guide research on how to restore past industrial disturbances. AWA asks again for a moratorium on oil and gas activities until a new management plan is developed with full public input, and that oil and gas be phased out of Rumsey as was originally conceived by the RID committee. “All agreements posted or sold in Rumsey Natural Area after being established by Order-in-Council are considered new and carry access restrictions agreed to within the” RID. Official documentation saying Rumsey natural Area is excluded from IL2003-25. The list of the 9 other sites excluded from IL2003-25. If any leases sold in the Rumsey NA after 1996 are considered new. The rationale for continuing to sell leases in the NA and insisting on surface access prior to any conservation studies (as required by the RID) being done to show whether ecological integrity is being maintained or not. AWA and the Alberta Native Plant Council host a tour of the Rumsey Natural Area for Energy Utilities Board (EUB) members to show them the area and discuss the history and issues. Information is provided on environmental significance and conservation milestones. Industrial sites are visited and development and reclamation practices discussed as well as invasive species threats to rough fescue grassland. AWA sends letters to the Alberta Premier, Parks, Energy, and Sustainable Resource Development requesting 1) Alberta Energy’s decision to be reversed and no new drilling to be allowed in the Rumsey Natural Area 2) Energy Utilities Board (EUB) hearings on any new proposed industrial activity in protected areas (as a short term measure to deal with these situations until they are all resolved.) 3) a province-wide review of protected areas, policy and legislation and what the public wants done with them. The EUB decides to continue processing the application without a hearing because it meets all the regulatory requirements. EUB maintains co-mingling will have surface impacts and approval does not mean wells or other activities will be approved. “While IL 2003-25 addresses Existing Mineral Commitments in Legislated Provincial Protected Areas, the lands applied for in the above referenced application are not in a protected area and therefore are not subject to the provisions of IL 2300-25.” When queried why EUB maintains Rumsey is not a protected area, no response is received. Energy criticizes Community Development for not moving forward or “facilitating” approval of well applications that have been on hold pending a review of the IL 2003-25 issue. Community Development, responds in turn that reviewing applications is time-consuming and that they should not be pressured to approve initial applications without proper reviews and process. Community Development has given 18 approvals for surface dispositions for access to mineral rights sold prior to 1996. Approvals for 10 other applications are pending. Alberta’s Energy Minister tells the media that Rumsey Natural Area is one of ten sites under Alberta’s Special Places program where new drilling is allowed, if environmental conditions are met and the Energy Utilities Board (EUB) approves. “At this stage, there’s no drilling. There’s no activity. So it’s far too premature to say anything would happen there or not.” In the same article Trident says its executives have not decided whether to apply to the EUB for permission to drill. A Memorandum of Understanding: Management and Issuance of Land Dispositions on WAERNA and PP Lands is signed by Deputy Ministers of Sustainable Resource Development and Community Development making Parks the lead agency in management of designated natural areas, including the Rumsey Natural Area. Joe Miller, Executive Director, Alberta Energy and John Kristensen, ADM, Community Development sign an “Access Review of ‘Subject to” Natural Area Parcels. IL 2003-25 provides direction for existing mineral commitments in all protected areas. Mineral rights in protected areas are sold with addenda that correspond to the levels of surface access as defined in management plans. Changes to existing levels of access require consultation with affected departments and, as necessary, affected stakeholders. The process will review and make recommendations on what happens with these lands when they are returned to the land bank. Sustainable Resource Development will be involved. CD will facilitate access to mineral commitments sold as “surface access subject to specific restrictions” if the agreement holders have done their due diligence. The process will objectively evaluate the natural resource values of each parcel and their contribution as a Natural Area to the protected areas system; and will evaluate the mineral resource values of each parcel with respect to tenure type and status, and the development activity within and adjacent to each Natural Area. Alberta Energy sends an interdepartmental directive to Community Development directing that approval be given for surface access to mineral dispositions with the “subject to conditions” addendum. Energy says it will continue to sell rights with the expectation surface access will be provided. To date, one well per section is being allowed. This neglects their promise made in Information Letter 2003-25 which stated that new commitments in 81 Special Places, which includes the Rumsey Natural Area, would not be allowed surface access. This means an open door to CBM development in the area, an activity never contemplated in the RID or the 2001 Assessment. A Technical Advisory Committee is established in 2006, including representatives from Alberta Natural Plant Council (ANPC) (Cheryl Bradley), industry and academia to guide research regarding reclamation and cumulative effects commitments in the RID. Terms of Reference for the Rumsey Parkland Project are created: Review of the Reclamation/Restoration/Remediation Program in the Rumsey South (Rumsey Parkland). Letter to EUB from ANPC notes that the mineral rights of two sections were sold to Trident in 2004 and are not ‘existing commitments’ as defined in IL 2003-25. EUB informs ANPC in a letter (17 May) that the EUB will continue to process Trident’s application without a hearing stating “the lands applied for in the application are not in a protected area and therefore are not subject to the provisions of IL 2003-25.” In a letter ANPC asks EUB to provide the authority for the latter statement. AWA and ANPC meet with Trident to review map of proposed wellsites in Rumsey and the company’s compliance records. Preliminary findings of a 2006 survey (Desserud, P. University of Alberta) of 63 wellsite and pipeline disturbances are that there are more non-native species on disturbed sites than undisturbed sites. Only a very few sites have rough fescue as a dominant; wheat grasses, Kentucky bluegrass or smooth brome dominate plant communities on the large majority of sites. An application #1435383 is filed with the Energy Utilities Board (EUB) by Trident Exploration Corp (with Fekete Associates) to obtain approval “to produce gas without segregation in the wellbore from the Edmonton sands and coals” in the Natural Area (Twp 33 Rge 19 W4). 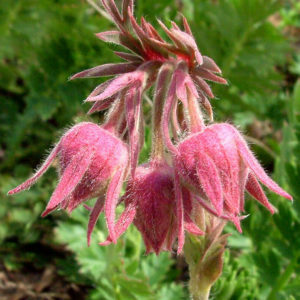 AWA and Alberta Native Plant Council (ANPC) write letters of objection to the EUB. Reasons are that commitments in the RID are not being met, concerns about the impacts of CBM development on the ecosystem and hence on the RID goal and that approval of this application will constitute approval of the drilling program. Memo from DM Community Development to Acting DM Alberta Energy regarding application of IL2003-25 in Rumsey: Community Development has not changed its interpretation of the IL. The disagreement between the two departments is on the application of the IL to 10 sites, including Rumsey, initially established as Special Places. “The IL clearly applies to Rumsey Natural Area, and therefore in those cases where conflicts exist between the IL and the 1993 Regionally Integrated Decision …, the IL which was signed most recently would prevail…..This is an important and contentious public issue that must be addressed as quickly as possible.” Community Development suggests a meeting to discuss respective concerns and moving forward. ANPC agrees to participate in a Technical Advisory Group (TAG) to guide the review of reclamation/restoration which will help evaluate if current management is achieving the goal of the RID and if management meets the expectations of a provincially designated protected area. Trident holds another public meeting with government representatives and conservation groups. They’re drilling 29 new wells (28 on public, 1 on private land). All compressors will be put outside the Natural Area, but this means larger diameter pipelines will be used (outside diameter of 5 inches). This is the largest pipeline proven to withstand plough-in installation. Community Development prepares a briefing note on IL2003-25″ Honouring Existing Commitments in ten Natural Areas including Rumsey Natural Area. The Issue: Ten of the first twenty-six protected areas designated under the Special Places Program are not covered by a no-surface-access addendum for ongoing mineral sales. CD requested that Energy amend the addendum on all lands included in these sites, contending that it was an oversight that resulted in a failure to update the addendum at an earlier date. Energy contends that Cabinet’s commitment (under Special Places) that there would be “no new development” in parks and protected areas does not apply to these 10 sites, despite signing off on Information Letter (IL) 2003-25 which acknowledges this commitment and refers to all “81 protected areas” established under the program. The ten sites were included on a list of 26 new natural areas established as part of the kick-off of the Special Places Program in 1995. March 2, 2005: Energy agrees to examine their files and review the status of subsurface commitments and sales activities in each of the 10 sites not covered by IL2003-25 and to assess potential options for resolving the issue. Community Development requests that any further mineral postings affecting these sites be postponed until the issue is resolved or, if sold, that they be sold with a no-surface-access addendum consistent with Cabinet’s commitment, Special places Policy, and IL2003-25. CD receives information on mineral interests in Rumsey, but not the other 9 sites. On two recent requests for mineral postings in Rumsey Natural Area, CD indicates Energy should postpone both sales until the issue is resolved or, sell them with a no-surface-access addendum. CD also indicates it would not provide Ministerial consent for surface access on any further interests sold after September 14, 20905. Energy indicated that it intends to proceed with postings for an additional 21.5 sections with the Natural Area in its December sale and that these lands will be posted with the addenda currently in place, pursuant to the Rumsey RID. These addenda do not preclude “new development” within the natural area. Community Development writes AB Energy: Another mineral sale requesting even more lands be posted than in the previous posting request for one section (see Sept 7, 2005). The same lands discussed then, which AB Energy agreed to hold off on until discussions regarding IL2003-25 were concluded are included again in the current posing request which is for 21.5 sections in the Rumsey Natural Area. Two abandoned, unreclaimed well sites with mixtures of native and non-native species colonizing largely unvegetated areas of gravel and sand. Trident’s first CBM well with a 5 metre wide row of cleared native vegetation planted to annual rye. The vegetation adjacent to the well site and road has been invaded by non-native species. Over-grazing resulting in changing plant community from rough fescue to mixed-grass. Deep tracks eroding a hillside. Invasive, non-native species along the Poco Road. AWA sends letters with photos to the Ministers of Sustainable Resource Development (SRD), Community Development and Energy. Trident meets with government representatives and conservation groups. Trident has 100 percent mineral ownership in five sections and contractual agreements with other companies to develop 26 other sections, 18 of which must be drilled before the end of the year, otherwise they revert to Canada Natural Resources Ltd., the original owner. They plan to drill one well per section to gather data to see how many more wells per section are needed. They don’t believe it is economically viable to drill more than four wells per section. ENGOs are concerned about rushing into CBM in Rumsey without appropriate background studies to show what is feasible and what will protect the integrity of the area, noting there is a lack of information surrounding how to reclaim rough fescue. ENGOs push for a volunteer stewardship opportunity in the area. Community Development says they don’t usually give stewardship in areas where there are leaseholders. Public Lands announces plans to evaluate industrial impacts in Rumsey where they will catalogue well sites, do a literature review, a develop a monitoring protocol in fall 2005 that will provide the scope of work for assessment of industrial sites in 2006. Once the initial background work is completed, they suggest engaging a local group of stakeholders, as a steering committee, to share in the review of the results and make further recommendations about management of the area. Trident Exploration Corp. and its parent Trident Resources Corp. raise about $280 million in private equity and $215 million in institutional term loan financing. The money will be used to finance Trident’s 2005 CBM exploration and development program in Western Canada. Sustainable Resource Development (SRD) and Community Development plan to meet with all industry stakeholders in Rumsey to discuss their plans and expectations and tell them what the government expects. Guidelines for monitoring studies, cumulative effects assessment and public involvement not being met. RID has no legal status, no penalty if guidelines are not met. Alberta Energy agrees to examine their files and review the status of subsurface commitments and sales activities in each of the 10 sites not covered by IL2003-25 and to assess potential options for resolving the issue. Community Development requests that any further mineral postings affecting these sites be postponed until the issue is resolved or, if sold, that they be sold with a no-surface-access addendum consistent with Cabinet’s commitment, Special places Policy, and IL2003-25. Rights to coalbed methane (CBM) in Rumsey have been leased to several companies, including EnCana, Canadian Superior, CNRL, Husky Oil, Pioneer natural Resources and Trident Exploration. Trident drills a CBM well (LSD8-S31-T33-R19) in the spring – at present the only CBM well – which is connected to a pipeline 50-100 metres to the south. Trident fails to provide adequate documentation to a third party pipeline company in development of its well. Consequently, pipeline construction is in contravention of requirements set out by Public Lands. The pipeline is trenched in rather than ploughed in, leaving up to a 100 m swath of disturbed topsoil, which is now highly vulnerable to aggressive invasion of non-native species. AWA meets with Trident and states it must withdraw from CBM development in Rumsey. Although the 1993 RID (management plan) allows for restricted conventional oil and gas development, it was developed prior to the Natural Area designation and CBM development is not considered. AWA believes that CBM development is contrary to the purpose and intent of the Natural Area designation and that it will significantly undermine the conservation values of Rumsey. AWA is asking government to suspend CBM development in the area, to designate it as a Heritage Rangeland and to revise the management plan to reflect its status as a protected area. Husky Energy signs a farm-out and joint venture agreement with Trident Exploration to develop CBM in central Alberta calling for an additional 120 wells to be drilled over the next 2 years. This agreement extends the original 2002 joint venture for CBM exploration in the Fenn Rumsey area. Trident holds its first public meeting Oct. 18 to inform “identified stakeholders” of their intentions and to help increase their understanding of CBM. The VP of Trident says his company hasn’t decided whether or not to proceed with commercial coal-bed methane development in the area. If it does, it will make sure to use existing roads and pipeline right of ways and will do everything it can to minimize surface disturbance. The Government has followed recommendations in the RID governing continued use of mineral resources and agricultural resources (grazing), but has not followed through on key recommendations aimed at protecting the area’s ecological integrity. Studying and monitoring ecological integrity is essential to know if the management goal is being met. After hearing ecological concerns Trident opts to hold off drilling any new wells until it can examine all impacts. A letter from the Prairie Conservation Forum recommends having a dialogue with the three departments, perhaps with the objective of developing a current management plan that reflects the Government’s priorities for the use and management of resources in Rumsey. A meeting of NAFTA’s Commission on Environmental Cooperation on grassland identifies important grassland areas throughout the Great Plains in North America. Alberta Energy Information Letter 2003-25 Re: Honouring Existing Mineral Commitments in Legislated Provincial Protected Areas states that mineral commitments that existed prior to the establishment of a protected area will be honoured and that applications for new surface dispositions for existing surface or subsurface commitments will also be honoured. However, existing surface or subsurface commitments within a protected area cannot be used as a basis to access new subsurface rights within a protected area. The IL refers specifically to 81 protected areas designated under Special Places, which includes the Rumsey Natural Area. The Management Committee for the Ecological Reserve has a February meeting. Instituting monitoring has been a major difficulty. The Stewarts have agreed to keep records of their grazing rotations. 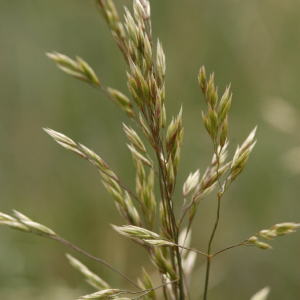 Public Lands has started monitoring a large no-grazing area and is keeping track of the invasion of smooth brome, a non-native grass introduced for cultivated pasture and which used to be allowed in gas-well reclamation seed mixes. There is discussion on how to deal with the mass of Canada thistle in and around a quarter section is supposed to be an ungrazed benchmark site. With the 2001 drought, the leaseholders have put in two new wells for a total of 4 on the Reserve. Dorothy Dickson resigns from the Management Committee and Dylan Biggs takes over as AWA’s representative. Dorothy had been instrumental in getting the Committee to put monitoring programs in place. The Management Committee for the Rumsey Ecological Reserve meets – monitoring tasks are discussed. After repeated requests from Dorothy Dickson, a representative from Parks and Protected Areas is finally assigned to the Committee. The Alberta Orienteering Association’s International Orienteering Meet is held in Rumsey Ecological Reserve. There are an estimated 300 participants. The Meet is supported by Public Lands staff, but others feel strongly that this is not an appropriate use of an Ecological Reserve. The Meet does not fit with the intent of allowing “nature-oriented activities such as bird-watching, photography, etc.” and it is thought that it will set a bad precedent. Signs are erected at entry points saying “Please help us preserve this sensitive area by keeping all vehicles on existing roads.” Funding was provided by Buck for Wildlife program and petroleum companies active in the area. These were the alternative to gates. There is concern that the change from winter to summer grazing by the new leaseholders in the Ecological Reserve (see 1999) may not be feasible. Dorothy Dickson and Cheryl Bradley prepare a paper summarizing the results of the 1994 range assessment and inventories and list information that needs to be collected or added for better management planning in the Ecological Reserve. They maintain that a strict monitoring program is needed and should be extended to include the Natural Area, which is slated to become a Heritage Rangeland. AWA and Red Deer River Naturalists (RDRN) express concerns to Public Lands about grazing management in Rumsey, providing Public Lands with scientific papers regarding grazing management on rough fescue grasslands; local leaseholders appear open to better management practices. In June an onsite workshop is held with specialists on fescue grasslands and grazing management with the goal of trying to devise a grazing regime and monitoring system in order to meet the management goals in the Management Plan. Because the idea of a Heritage Rangelands category is popular, it is added as an amendment to the Wilderness Areas, Ecological Reserves, and Natural Areas Act on May 30, 2000. 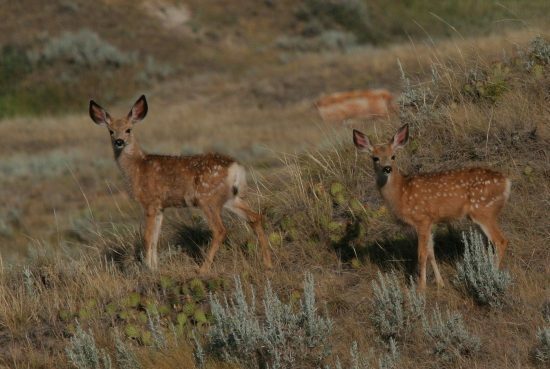 AWA and the Red Deer River Naturalists enquire to commitments made in the Regionally Integrated Decision (RID), which states that the Central Region Resource Management Committee (RRMC) will produce an annual report to update regional plans. It also says the RRMC will put out an assessment of the RID every 5 years and evaluate whether it needs a major review, which would entail public involvement. Bill 15, the proposed Natural Heritage Act is introduced on March 1. After much public discussion, the Government makes it very clear that the province will not budge from its explicit endorsement of the policy of honouring existing dispositions, whether or not they are in existing or new “protected” areas. They also are apparently willing to accept Off-Highway Vehicle (OHV) use in some protected areas. They say that if a mine was approved for a protected area, they would remove the protected status of that part of the area. They say forestry activity was not compatible in protected areas – so no areas with a timber allocation would be protected. The Natural Heritage Act it is never passed and is not re-introduced. 67 parcels of oil and gas leases in the Rumsey Natural Area and Ecological Reserve are sold. The grazing lease in the Ecological Reserve, which has been held by the Usher family for about 90 years, changes hands. Neither the Management Committee nor Public Lands is informed until the transfer is complete. The concern is that the new leaseholders are changing the grazing management from winter to summer grazing. This particular area had been chosen as the representative Ecological Reserve for the Central Aspen Parkland Region because it is in better ecological health than areas further south. It is believed that this is due to the management practices of the Ushers. Winter grazing was not stipulated in the Management Plan and, therefore, was not a required management practice of the new leaseholders. Public Lands staff say that summer grazing is not prohibited in the Plan; the Plan gives them the authority to approve “significant changes” to leaseholder practices and do not oblige them to discuss them with the Committee; the new leaseholders would not have anyone living on the lease, unlike the Ushers, so winter grazing was less feasible; it was their job to plan a grazing regime for summer-only grazing that would not harm the ecology of the Reserve and they believe it can be done using rotational grazing. AWA and Red Deer River Naturalists (RDRN) object to a proposed Amoco pipeline through Rumsey. Amoco Canada plans an alternate route for an ethane pipeline which was initially proposed to run 14 km across the Rumsey Natural Area. The new route lies south of the Natural Area. The Management Plan for the Rumsey Ecological Reserve is completed. In January the Government introduces the Proposed Policy Foundation for a “Natural Heritage Act”, followed by Management Guidelines for Protected and Recreation Areas, and Comparison of Management Guidelines under Current and Proposed Legislation. Conservation organizations welcome the intent of having all types of protected areas under one, clear piece of legislation and many industry groups also support the idea. There is some confusion about the categories under which land would be protected. AWA believes the creation of a new category, “Heritage Rangelands” would be a positive for the Rumsey Natural Area as it would prohibit mechanized recreation and would have stricter regulation of energy extraction than in the RID, apparently with the aim of eventually phasing it out. Sale of mineral rights in the Wildland is opposed by conservation organizations. A request is again made to develop a revised management plan for the Natural Area; expressing concern to the Special Places Provincial Coordinating Committee about use of the RID as the management plan for the Rumsey Natural Area. Conservationists learn the province intends to sell by auction 44 new oil and gas rights in the Rumsey Block. This is given as 33 in Hansard. The Environment Minister asserts that carefully managed development is acceptable in protected areas and that Rumsey would be the model for Special Places, not the exception. The auction of oil and gas rights is on June 25. About 80 percent of the quarter sections in the Rumsey Natural Area are available for new wellsites and road development. Current wellsites and roads will likely not be reclaimed because of the potential for future exploration and development. There is a ban on new road access into the Ecological Reserve but directional drilling into the southern part of the Reserve can occur, but has to be from the Natural Area. However, replies from the Premier and Ministers all assure everyone that the rights being sold would have to comply with the RID, which had been written after extensive public consultation and that the majority of the leases would have “no surface access” and must use only “existing routes” as set out in the RID. 612 acres of land adjacent to the Reserve is bought by a coalition of Ducks Unlimited, the Nature Conservancy and Alberta Fish and Game and will act as a buffer zone. The Protective Notation Reservation (PNT 840668) held by Parks is cancelled and the Natural Area is numbered NAA97003. AWA comments on draft Rumsey Ecological Reserve Management Plan. The Rumsey Natural Area (NA) is established by Order-in-Council 390/96 as part of the provincial Special Places program. 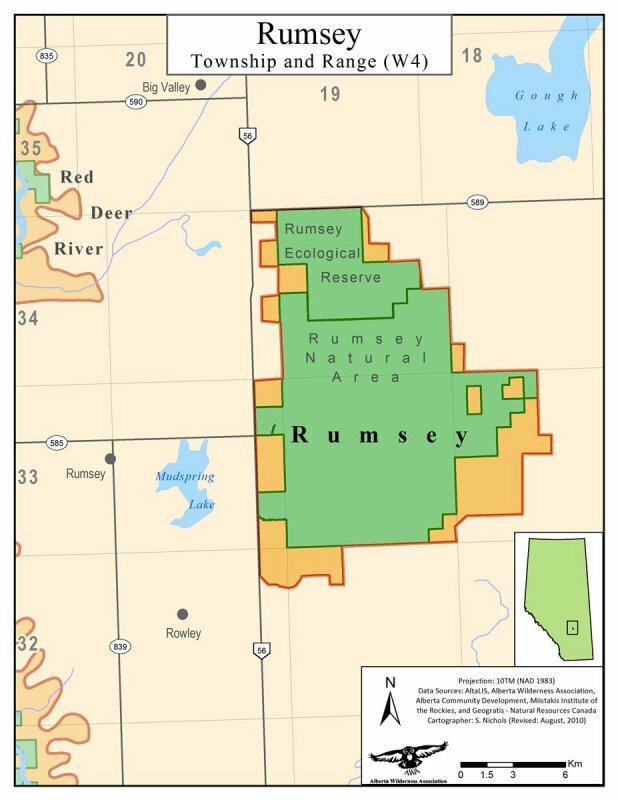 Alberta’s Environment Minister nominates Rumsey South as a Natural Area – the lowest possible protective category and one which would ensure that oil and gas extraction could continue. The Special Places 2000 Provincial Coordinating Committee supports the designation; having been assured it had a RID as its Management Plan. However, one of the PCC members [CPAWS] later said “we had not seen the RID nor understood its implications. We never would have endorsed Rumsey as a Special Place if we had known that new industrial development is allowed there”. It is clear that the hedging over granting any real protection for the Rumsey Block is because some companies are now successfully drilling into deeper reservoirs, mainly, if not entirely, for gas. A new version of Natural Heritage Policy – Special Places 2000 is released and economic development is added to its goals. Rumsey South is on the list of proposed Special Places. CPAWS and FAN withdraw from the Special Places Coordinating Committee in protest. The Rumsey South Block has 74 km of roads, 24 test holes, 58 wells (8 producing) and has had many kilometres dug for gas pipelines. The results of a 1991 study on reclamation of disturbed industrial sites in the area are finally made public. About 80 exploratory wells have been drilled. Even after 15 years, native vegetation, particularly fescue grassland, has not re-established on re-contoured roads and wellsites. Weeds introduced in non-native seed mixtures are invading the native prairie. Since reliable native seed mixes are not available, Public Lands Division is experimenting with alternative methods for reclaiming fescue grassland, including sod transplanting and sprigging. With no further public consultation nor the promised review, the new RID finally comes out. The RID says Rumsey contains about 0.01 percent of Alberta’s reserves of oil and less than 0.00001 percent of its gas reserves. The RID promises to ensure that its provisions “remain relevant and can be modified according to changing conditions” and that there will be “adjustments” to ensure compliance with a new regulation, Act or Cabinet approved policy. However, according to Dorothy Dickson, if there is to be a protected Special Place in the Parkland Region, Rumsey is one of the only possible candidates and it would make a sham of the Special Places 2000 Program to designate it as a “protected representative sample” and then allow the continued degradation of it by the energy department and industry under the RID. After the Provincial election, Ty Lund, who had been the government’s strongest critic of Special Places 2000, is made Environment Minister there are many assurances that Special Places 2000 would not “interfere with” oil and gas development. Dorothy Dickson (AWA) and others withdraw their nomination of Rumsey for SP 2000, fearing that any designation might prove more of a threat even than the RID. AWA is invited to a meeting with Board Members of the Energy Resources Conservation Board (ERCB) and Public Lands to discuss implications of the RID on energy activity in South Rumsey. Spring: AWA is NOT invited to a negotiation among RID government participants regarding phase out. Minerals Division, the only opponent to a sunset clause, prevails. AWA requests reasons for the Mineral Division’s rejection of the phase-out option (letter 31 May 1993) but there is no response. According to AWA’s assessment of the RID, only 41 of 232 quarter sections in Rumsey will be subject to the no surface access addendum. Gulf Canada proposes a coalbed methane project in the Fenn-Big Valley field. Six wells are drilled. Reasons for the project include drilling wells to evaluate the areal extent of CBM productivity and determine the long-term productivity of wells in this area and the resultant potential for commercial development. The first Special Places 2000 draft recognizes that the Parkland is one of the regions lacking adequate representation and that “the largest remaining contiguous” area should be identified for protection. The report recommends that selection criteria “weigh protected area values versus other uses”, that “major disturbances associated with energy development will not be allowed in Special Places” and that current activities in an area will be evaluated to ensure long-term environmental impacts do not occur; where such current activities appear as anomalies they will, where practical, be phased out. The Steering Committee for Ecological Reserves requests that a small planning team be formed, consisting of a representative from AWA, the leaseholder and the government (Fish and Wildlife, Public Lands and Provincial Parks). Dorothy Dickson agrees to represent AWA. There is still no sign of the revised RID promised for the spring. It is discovered by conservation groups that new drilling licences are still being issued. AWA informs the Energy Resources Conservation Board (ERCB) and Alberta Energy that three companies (Renaissance, North Canadian Oils, Poco Petroleums) have stated they will be doing no further activity in Rumsey, largely due to marginal economic returns. AWA asks that the Minerals Division define an end to mineral activity in Rumsey either by discontinuing sale of rights or placing a “no surface access” addendum on rights that are sold. A compelling reason for doing this is that we do not know how to reclaim fescue grassland. The biggest decision facing the RID committee is whether or not to adopt measures which will officially define an end to oil and gas activity. Eight conservation groups and grazing lessees want an end to oil and gas activity. Over a third of petroleum companies operating in the block, including the two major players, are ready and willing to phase out their activity, provided current commitments are met. A study of vegetation on six well sites in the Wildland concludes the plant species composition of the majority of disturbed sites (dating from 1977 to 1983) is not similar to that of adjacent range (Integrated Environments Ltd 1991, for Public Lands). Industrial sites were not restored to a native condition after 15 years and that, except for small pipelines, there was invasion of non-native species. Because the draft RID is considered inadequate by so many respondents, a Round Table meeting of participants in the RID in Big Valley (Nov. 21), followed by a public meeting is convened. It is chaired by Ian Dyson and the 30 participants included government departments, energy and grazing lease holders, municipalities, Cattle Commission and conservation organizations (AWA, CPAWS, RDRN). Follow-up submissions are accepted until Dec. 31st. The only disagreement to the concept of phasing out industry activity in Rumsey in the short term (5 -10 years) is from Mineral Resources. A proposed wording for a sunset clause to be included in the RID is developed. Option for phase out is put forward for consideration at the ADM level by the planning team. There is general agreement (except by the Energy Dept. which took virtually no part in the discussions) that the area must have better protection, that current oil and gas wells should be depleted as quickly as possible (10 to 12 years was accepted as reasonable) and all extraction activity be phased out. In the meantime there should be stricter regulation of sites, roads etc. and of reclamation. Conservation groups request more information be included regarding ecological values, the value of the energy resources, job creation values, etc. It is emphasized that more baseline ecological information is needed and more provision for monitoring the effects of grazing, recreational uses, etc. It is agreed that mechanized recreation should not be allowed at all. Suggestions by the Parks Dept. of putting in camping facilities were strongly opposed and withdrawn on the spot. The majority of those attending were quite pleased with the outcome and the Energy Dept said they would undertake to have a revised RID document ready for public review by early spring of 1992. 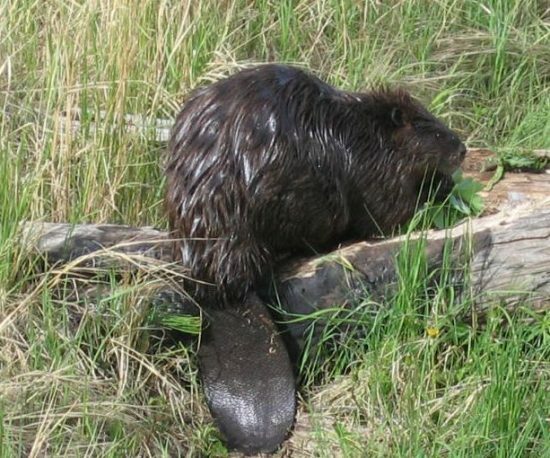 The Canadian Nature Federation Conference, hosted by Red Deer River Naturalists, passes a resolution calling for protection of the Rumsey Block including the phase out of energy extraction, reclamation of all disturbed land including roads, and public use to be limited to non-mechanized forms of recreation. A draft Regionally Integrated Decision is released to the public on June 10. It notes that “this report was agreed to” by all of the participating departments. It does not say what the consulted groups and agencies thought of it. The stated purpose of the RID is “To preserve and protect the Rumsey Aspen Parkland ecosystem while allowing for responsible use of its resources.” However, the RID never defines “responsible use” nor establishes priorities for ensuring protection. A project will be undertaken to assess revegetation by native species of disturbed sites. The mineral rights sold after Jan. 1, 1991 will have “no new surface access” addendum attached. Access points to the area will be gated. Mineral rights will continue to be sold throughout the block and exploration and development will continue in perpetuity where there currently are trails and roads, even though oil and gas resources are obviously not significant (i.e. only 8 of 58 wells drilled are in production). New access can occur to those rights sold prior to Jan. 1, 1991. This then becomes existing access. The plan does not indicate how extensive this new activity might be. The plan suggests a program to control expansion of aspen and shrubs without demonstrating an understanding of the trends and factors affecting this (i.e. climate may be the overriding factor). Theoretically control could include mechanical and chemical means which would not be consistent with conservation objectives. Alberta parks wants to continue to hold a reservation on the area but their intent for the area is unclear, i.e. preservation or recreation development. The RID does not suggest a legal designation for protection. A reservation gives Parks very little, if any, control over developments. AWA requests that the United Nations World Heritage Committee consider eight sites in Alberta for World Heritage Site designation. One of the sites is Rumsey, as the largest contiguous unit of native aspen parkland left in the world. The Committee later sought input from government agencies regarding the suitability of proposed sites. Rumsey did not make the recent final cut of tentative sites for Canada because, as per the guidelines, it was not considered unique or important enough according to those consulted. AWA works cooperatively with ERCB and North Canadian Oils Limited (NCO) (office and field trip) in reviewing plans for a proposed well in 1-2-33-19-W4. Matters discussed include the need for the well, potential for directional drilling, infrastructure on the site, access during construction and operation, and reclamation. NCO agrees to special measures to reduce environmental impact. AWA works cooperatively with the Energy Resources Conservation Board and Summit Resources Limited to define measures which will reduce the environmental impact of a proposed well in 1-33-32-18 W4M. The Rumsey Ecological Reserve is established by Order-in Council 511/90. The Reserve is on the Usher Ranching Ltd. grazing lease, covering 33.5 km2 at the north end of the Block. In accordance with the Wilderness Areas, Ecological Reserves and Natural Areas Act, no new energy leases are allowed in the Ecological Reserve (ER) and the three already there are to be phased out as soon as possible. An ER Management Planning Committee is set up on which Dorothy Dickson represents the Alberta Wilderness Association and the Red Deer River Naturalists. The establishment of the Ecological Reserve is preceded by a major confrontation between conservationists and the Parks Minister who at the last minute sought to scale down boundaries which had been agreed upon through public process. Official dedication of the Rumsey Ecological Reserve occurs on 9 Oct 1990. Among the issues to be addressed are existing and proposed oil and gas activity and uncontrolled motorized access, which has increased with the construction of all-weather roads by the oil and gas industry. The Decision is scheduled for completion in March 1991. Of 56 wells drilled over the last decade, with resulting terrain and vegetation alteration, only 50% have been producers, many only marginally. Eight different companies are operating in the area with no coordination. Two are producing oil wells, sixteen are producing gas wells, 13 are capped gas wells and 25 are abandoned wells. All-weather roads and major trails now run through the area accessing producing wells and allowing easy vehicle access to the heart of the block by the public. Further deterioration of conservation values is foreseen when capped wells are brought into production. The ERCB has concluded that the Rumsey Block has only moderate future potential for exploration and development of oil and gas resources. According to Alberta Energy, bids for leases in the area have been generally low by provincial standards. Discontinue the sale of petroleum and natural gas leases in the block. Develop a coordinated plan to expedite extraction of already proven gas resources. Design guidelines for petroleum and natural gas development activities and reclamation which minimize impacts on the natural environment. Consider mechanisms for recognizing the contribution towards conservation of companies who voluntarily allow leases to lapse without drilling. Conduct studies to determine the type and location of significant natural and archaeological features and environmentally sensitive areas. Reassess stocking rates, distribution patterns of cattle and range health to ensure that grasslands are not suffering depletion and that environmentally significant sites are not being damaged. Develop a public access plan which protects wildland and wildlife values and recognizes industry (in the short term until activity ceases), grazing (perhaps management of cattle could be done on horseback), and wildland recreation (non-mechanized) interests. Forestry, Lands and Wildlife, Recreation and Parks and the Energy Resources Conservation Board (ERCB) decide to develop a Management Plan in the form of a “Regionally Integrated Decision” (RID). The Alberta Department of Energy is not officially involved at this point. The Prairie Conservation Action Plan (PCAP), published by WWF Canada, recommends that Rumsey be given protection as part of the WWF Endangered Spaces Campaign. It states: “Protect at least one large representative area in each of the four major prairie ecoregions.” The PCAP is endorsed by all three prairie provincial governments. Drilling activity peaked in 1985 when 12 wells were drilled and has fallen steadily since then to only 2 licences so far in 1989. Pools in the area have been fairly well defined and the assessment of the government is that the area has only low to moderate potential for further finds. Several existing gas wells (there are only 2 oil wells) have been very short-lived (4-5 years) and have not been big producers. With only a few exceptions, bids for leases in the area have been low by provincial standards. Alberta Energy and ERCB are willing to participate in the RID for the Rumsey Block in order to obtain consensus on how to handle sake of further leases and on what conditions to put on licences. Site specific guidelines for oil and gas development are re-confirmed as adequate. Public hearings are held regarding the formation of an Ecological Reserve in the northern portion of the area for 13.25 sections. There is no opposition. AWA participates in the development of the Prairie Conservation Action Plan 1989 -1994. A permanent gravel road is built without public consultation by Poco Petroleums Ltd., an oil and gas company that had acquired most of the wells in the area. It runs 10 kms from the west boundary to an oil well near the eastern boundary. It accesses about a dozen gas wells and compressor stations by side roads and cuts the area almost in half. The Lands Divisions tells AWA they are not required to contact public interest organizations, even if the groups had shown a long-standing, well-documented interest in the area. AWA meets with Poco representatives to inform them about the area’s significance, obtain information on Poco’s future plans and to seek support for planning for the area’s protection. Cottonwood Consultants prepares a report The Proposed Rumsey Ecological Reserve: A Biophysical Overview for Alberta Recreation & Parks. A meeting on the proposed Ecological Reserve is held May 10 in Drumheller. Guidelines for oil and gas activity developed by AWA and representatives from the ERCB, industry and government in 1982-83 are implemented for the drilling of about 30 exploratory wells between 1984 and 1987. Guidelines include: no permanent roads, recontouring disturbed wellsites and revegetation with native species. AWA determines location of sites, contacts industry to discuss plans where there is concern about impacts, conducts periodic field checks to ensure guidelines are being followed and reports to members on the status of industrial activity. Special guidelines for oil and gas activity within Rumsey are established by the Energy Resources Conservation Board (ERCB) and Public Lands. The Alberta Government prepares a report: The Candidate Rumsey Ecological Reserve: A Biophysical Inventory for the Natural Areas Program, Alberta Energy and Natural Resources. AWA hosts a field trip with a local grazing lessee and representatives from Dome, Chevron and the Environmental Resources Conservation Board. It is agreed that the area merits special consideration. Discussions focus on guidelines that might be applied to allow oil and gas development while protecting the unique wildland character. AWA incorporates ideas from the trip and suggestions from a meeting with the Energy and Natural Resources (the government agency responsible for the area, January 1983) into a set of proposed guidelines that is forwarded to the Deputy Minister of Energy and natural Resources for his comment and suggestions. The guidelines are established as government policy. AWA approaches companies holding oil and gas leases in the Rumsey Block, inviting suggestions regarding the kind of restrictions on or modifications to seismic, drilling and road-building activities which would be compatible and practical for their activities while retaining much of the wildlife character of the area. A task force is formed to begin the development of a set of guidelines for oil and gas activity in the area. The need for integrated land use planning is also identified. The Ecological Reserve area is reserved as a conservation area (RLC4) by Public Lands. A 3445 ha area in the Rumsey area is nominated as an Ecological Reserve. It is one of 3 areas of 15 or more sections, and the most representative, of the parkland region that is also large enough to withstand recreational use. It is the only large relatively undisturbed area of aspen parkland on hummocky disintegration moraine left in Canada. The moraine plateaux are not cultivated or overgrazed. The fescue grasslands are unsurpassed in Alberta. The saline, wet meadows in the glacial spillway are not overgrazed. An ecological benchmark is present in NW 14-34-19-W4. Rare and uncommon animal species inhabit the area. It is within one grazing lease. It includes some of the most spectacular hummocky disintegration moraine in the region. An Alberta Recreation, Parks and Wildife report Aspen Groveland Resource Assessment: Rumsey Area is prepared by Lynn and Cheryl Bradley of the Resource Assessment and Management Section. The Usher Ranching Ltd. has its lease renewed for a ten year period. The Reserve is included in their year-long rotational grazing system. An assessed carrying capacity of 28 acres/head/year is maintained. There are 4 grazing leases: Imperial Ranch ltd., Usher Ranching Ltd., Rowley Grazing Association, Jake’s Butte Grazing Association. There are two Ducks Unlimited easements (see 1960), two Wolf Hill Rural Electrification Association easements, two pipeline agreements, one with Dome petroleum and one with East Central Gas Coop Ltd, a licence of occupation by Alberta Gas Trunk Line, ten abandoned gas wells. Existing leases are up for renewal between 1977 and 1981. All rights to crown coal are reserved and no applications have been accepted since 1975. Present coal leases covering the entire Reserve are due to expire in 1994. Cheryl Bradley (biologist) conducts field work in Rumsey for Alberta Parks. This is part of a program to identify, evaluate and preserve the remaining undisturbed tracts of Aspen Parkland in Alberta. Rumsey is the largest of three block identified. She co-authors a report that provides an overview of biophysical attributes and land use. The Alberta Parks Division recognizes the Wildland an area of high environmental significance and requests a “reservation for conservation purposes” on all public lands included within the Rumsey block (70 sections). A reservation with no dispositions (RLC7), for conservation purposes, is granted on land that was set aside in 1967 as a Grassland Research Reserve for the Dept. of Lands and Forests and the University of Alberta as recommended by M. Forbes of the Lands Division. This is in the far northwest part of the area (northwest quarter of section 14-34-19-W4). This quarter section was check-sheeted by the Alberta Terrestrial Community Section of the International Biological Program in 1970 and was fenced to exclude domestic livestock in order to establish a benchmark area for comparison and research purposes. It was removed from the Usher grazing lease, in what later became the Ecological Reserve, and has not been grazed since. It used to be, and sometimes still is, referred to as the natural area. This sometimes causes confusion with the later established Natural Area but this quarter is not under any separate legal designation and remains part of the Ecological Reserve. S. Hatfield of the Lands Division suggests preserving an expanse of grassland in the area for future study and recreational needs. The prime deer habitat is popular with hunters and waterfowl is abundant. Lease holders want to graze at 20 acres/head/year, but investigations by R. A. Wroe in for the Lands Division conclude that a carrying capacity of 24-25 acres/head/year would be the maximum density allowed for sustained forage production, and only if there were superior management in animal distribution. The area is being grazed by the Ushers at stocking rates of 26 to 34 acres/head/year. A study of vegetation and grazing capacity is undertaken. One quarter section (NW14-34-19-W4) is designated a Natural Area and fenced from grazing as a benchmark against which to monitor grazing practices. Part of the Usher lease is reassigned to the Rowley Grazing Association and Jake’s Butte Grazing Association. Part of the Walters family grazing lease is deleted in favour of the Rowley Grazing Association. The remainder of the lease is assigned to the Imperial Ranch Ltd., a company formed by four local ranchers. The Walters family obtains a twenty year ancillary agreement to their grazing lease in the area to erect ranch buildings and corrals on 80 acres of public land. By 1964, 160 acres of public land in the vicinity of the buildings are broken without authorization for cultivation. The carrying capacity for the Usher grazing lease in the reserve is lowered to 28 acres/head/year. Much of the native vegetation is altered by livestock grazing or destroyed through cultivation. Two Ducks Unlimited easements (1960 and 1964), part of the Big Valley Pothole Development Project, become effective on 29 quarter sections in the area. Ducks Unlimited surveys the area and recommends “draining a number of potholes into each other to create permanent keewaters” which would serve as prime waterfowl breeding habitat. The Big Valley Pot Hole Development is carried out in the late 1950’s and early 1960’s with ditches cut between potholes in approximately 15 different locations. The ranch, which has been jointly operated by Tom Usher and Jim Walters, is divided. The carrying capacity for the Usher grazing lease is set at 32 acres/head/year. Tom Usher and Jim Walters acquire the grazing lease from Burns & Co.
Burns & Co. purchases the grazing rights from the Imperial Ranching Company which had been grazing the Rumsey free of charge. They erect fencing. The Dominion of Canada legal land survey is completed in the area. Livestock grazing through crown grazing leases begins in the Wildland. Settlers begin to move into the area to homestead. Targeted extermination by colonialists causes the extirpation of bison and wolf, forcing most Indigenous Peoples into government-surveyed reserves. Explorer Peter Fidler comes across Rumsey; he notes the rolling terrain occupied by thousands of bison, and several groups of Blackfoot who hunt and camp nearby. He identifies “Gopher Hill” on the east boundary of the block and the “Hand Hills” to the southeast. Indigenous Peoples value the Parkland for its abundant wildlife including bison, wapiti, pronghorn, mule deer, white-tailed deer, furbearers and some moose. They use fire to modify movements of bison and for communication. 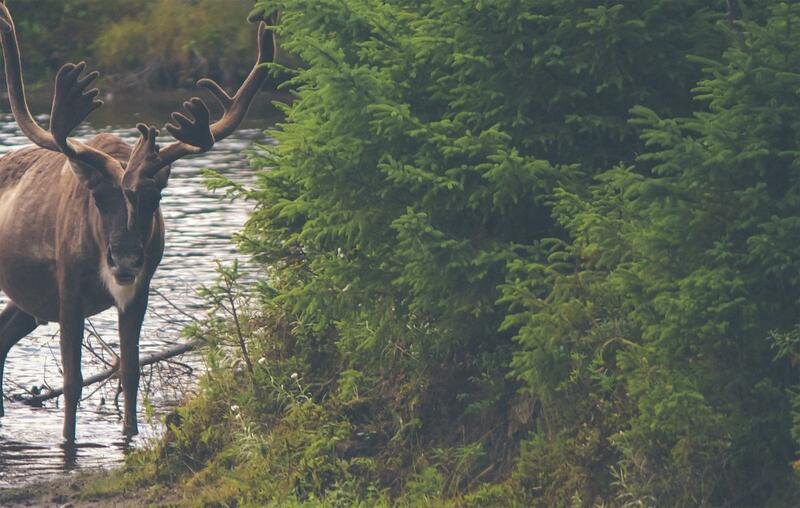 In the late 17th and 18th centuries fur traders and bounty hunters come to the area because of the abundant wildlife.